And the new year's efforts continue! This salt-free, naturally flavourful soup was inspired by Gillian McKeith's recipe for Green Goddess Soup, tailor made for winter detox, though I think it's lovely at any time of year. My version turns out more orange than green, but the more greens (kale and spinach) you add, the better the detox. Saute the onion and garlic in a sauce pan with a little water for a few minutes. Add the turnip or sweet potato and saute until they just begin to soften. Stir in the stock and ginger and simmer for 10 minutes. Add zucchini and kale and cook over medium-low heat for half an hour, covered. At the end, stir in spinach and lemon juice, letting the spinach wilt. 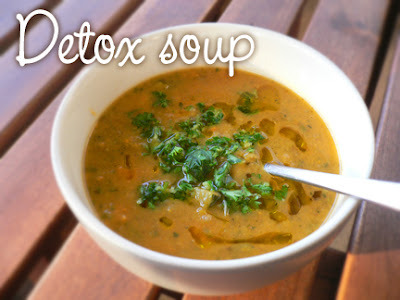 Puree half the soup in a blender or using a hand blender and serve with a drizzle of flax oil and generous scatter of parsley and fresh pepper. Serves 3. Thanks Claudia - this looks delicious. Hello, I am not sure how i found your blog but I am glad I did. I have just discovered Ayurveda and am loving it so far..alot to learn but it really does sit right with me.. seems I am pretty much a vata with a tiny bit of pitta thrown in. I love the look of all these recipes as I am in the process of trying to work out what I can and can't eat and to find some recipes to help..thanks! I highly recommend the book "Ayurvedic Cooking for Westerners" by Amadea Morningstar for guidelines, a comprehensive food list, and lots of recipes. Love your blog. I happened to be searching for breakfast millet and found you. I'll definitely be checking back in to see what else you have going on. I love this place. Yay, Christie! I saw your running blog and have to commend you on your determination. I hope the food here gives you some good, clean energy! Question for you - Is there any restriction on when and how this soup should be eaten? Can I just make this soup and have it as a dinner one day of a week or something like that? You can see from the ingredients that there's nothing especially medicinal about the veggies, they just happen to be really good anti-oxidant vegetables high in vitamins and natural detox qualities. So have it anytime! Lunch, dinner, summer, winter -- have it often for good health in general, or especially after feeling ill or taxing your system too much with stress or bad foods. Good for coming off of a fast, too. Hope this answers your question! Btw, I have blog-rolled you, hope you don't mind. I love your soup! There's plenty of salt in the veggie bullion. So, not salt free. I'm certain all of your readers are intelligent enough to figure that out though. LOVE IT!!!! I ate it with a buttermilk biscuit just now. it was amazing. I am wondering where you studied Ayurveda. I'm 20 and already know it's what I want to study, now I'm just looking around at my options. Also, while I have you here I was meaning to ask how to go about family dinners. I love to cook Ayurvedic meals for fam and friends but not everyone is as much a pitta as I am (although a good majority of my family is pitta-inclined)..
And to the last comment, that's great that you've found your calling! As for cooking for families, you're always safe preparing tridoshic meals, which have ingredients that are good for everyone and omit extremes like hot spices, heavy fats, sour tastes, too much salt, etc. And for the record, I haven't formally studied Ayurveda, I just learn as I read and post my findings, also based on workshops, experience, and consultations. This was so good. Thanks for posting these great recipes! Hi, never been to an actual ayurvedic practitioner, but on what i do know is that I prefer spinach over all other, I am right now of a Kapha mind with a Vatta body! nice recipie!